Patented blade holders – are made from a special polyurethane mixture. Blade holder section deforms and moves backwards, allowing the snow plow to move smoothly over the obstacle. At a speed of 40 km/h the blade holder passes obstacles up to 12 cm high with no problems. Copies the road surface to the maximum – 305 mm sections of the blade holders enable using blades of different length (305 – 1200 mm). Shorter blades copy the road surface the best. Less noise – The soft polyurethane material reduces the transfer of vibration to the moldboard, and the caused noise is therefore significantly lower. 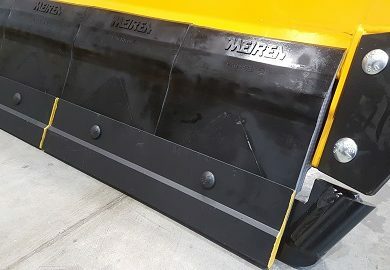 Saving the road surface markings – Patented elastic blade holder saves the road surface markings.